Souvenior Bali Discovery Shopping Mall is one of the huge malls in Bali and the only mall which has a beachfront. 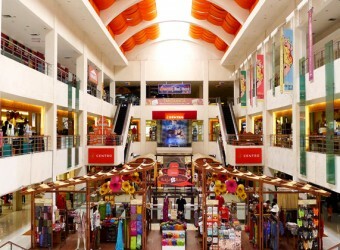 This huge and fully air-conditioned mall is located in Jalan Kartika Plaza, opposite the the Waterbom Park. It consists of three storey with Sogo Department Store and the Centro Department Store featuring famous international brands. I went to Discovery Mall on the way back from Waterbom. It`s very large, it also offers bargain sale.I think there are also a large number of tenants. I think it`s a shopping mall is good for family, you can find game center and karaoke here. It`s nice to watch the beautiful sunset on the beach of this shopping center in the evening.